The desert landscaping trends are anything but stagnant throughout Coachella Valley. If you’re looking for landscape supplies in Coachella Valley and Palm Springs that can take your home to the next level, we’ve got a great solution: Natural Stone Panels. Appropriate for both inside or outside, natural stone panels are easy to install and can be used in so many ways. From creating an accent wall in your home to complementing your pool’s cascading water features, a natural stone panel can add both uniqueness and texture to any landscape. At Whitewater Rock & Supply we have a great selection of natural stone panels that look as good as individually set natural stone. Natural and Low-Maintenance – Not only will you have an all-natural rock and stone panel, but it will also be very easy to maintain. Natural stone requires very little care once installed and quality natural stone veneer will last long after your project is completed. Easy to Install– Rock panels streamline façade installation. The natural stones are already fixed onto modular sheets, reducing the labor of stacking individual stones. Durable and Weatherproof– Natural rock panels will not lose their color or texture and are strong enough to resist the trauma of baseball bats, bicycle wheels, lawnmowers and more. They can be used in all climates, and withstand the extremes of our desert temperatures. Waterproof – When fixed with the appropriate adhesive, natural stone panels can be used in and around water, meaning they can be installed near pools, fountains and waterfalls. Use Outside or Inside –Rock panels can be installed on top of a variety of materials including brick, stucco, wood or masonry. Combined with its durability, this makes it ideal for use inside your home or on the exterior as well. Natural stone panels can be used in so many ways throughout your home to create contrast, add color, create texture and even serve as a focal point for your home. Exterior – Use rock panels as a solid façade for the front of your home, around windows or columns or as a more appealing surface on a retaining wall. You can never go wrong with an updated entry way to boost your curb appeal either, and a natural stone panel around your door, window or as an accent wall would be a unique twist. Kitchen –Turn up the heat in the kitchen with some natural stone panels. Stone panels work wonderfully as a backsplash or for contrast on an island. Fireplace Facing – Make your fireplace the focal point by adding natural stone paneling to fill the surrounding wall, or simply as a border to create a natural stone mantel. Facing for Columns or Stairs – Adding rock around columns either partway or full as well as the front of stairs can add an upgraded feel to your home. Some homeowners even choose to make their wall facing the stairs an accent piece with natural stone paneling. Accent Wall – Any room, from the entryway to the master suite can benefit from adding stone panels on an accent wall. The style of stone may create a coziness or a sleeker and modern feel. There are so many creative ways to use natural stone panels to upgrade the appearance of your home. Our experts at Whitewater Rock & Supply can help you choose a color and style that works for you. We work with homeowner, builders, architects, landscapers and other industry professionals throughout the Palm Springs area and deliver as well. 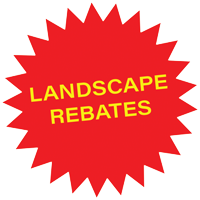 Our years of expertise and our vast selection of natural stone, rock and boulders can help you get the job done. 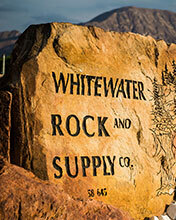 At Whitewater Rock & Supply Co. We pride ourselves on providing you with some of the best landscape supplies in Palm Springs. 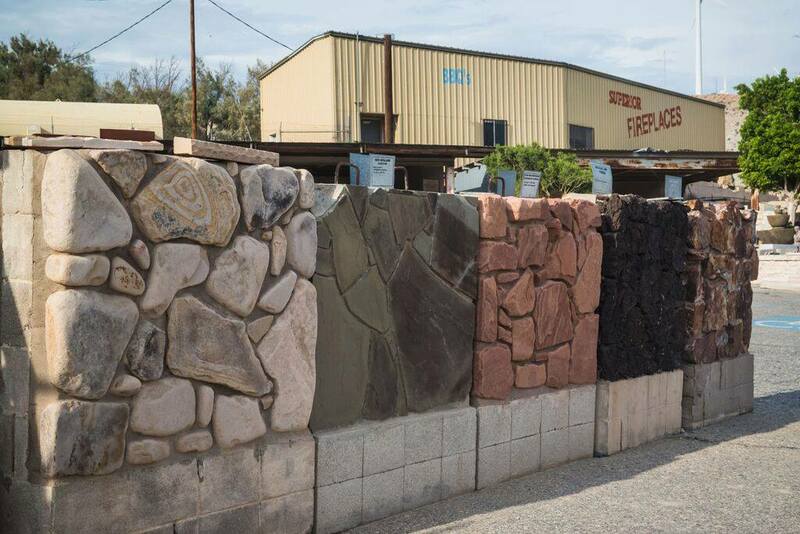 Come visit our rock yard to see our vast selection of Palm Springs gold, crushed rock, boulders, building stone, natural stone panels and more.